Are you ready to pit your driving savvy against six international courses? Pick one of eight mean machines and let's go! Need for Speed II is fast and realistic with detailed 3D graphics and full-circle view. And when you think you're ready, try the two-player split-screen mode for teeth-grinding competition! Need for Speed 2 is the follow up to Road & Track's The Need for Speed. Instead of normal exotic cars like the first game included, it had exotic supercars such as the McLaren F1, Ferrari F50 and unreleased concept supercars such as the Ford GT90. 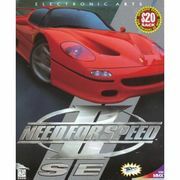 A special edition was later released with a few more cars, an extra race track, and also included 3Dfx Glide support for Voodoo-chipset video cards, marking the first hardware 3D acceleration support in the Need for Speed series. The PlayStation version also supported the Dual Analog/Shock controllers, and Namco's neGcon controller which was designed for the Ridge Racer series.